When we awoke, there were none of the mosquitoes around from the night before. This allowed us to peacefully break camp early and head to the gas station/store to get a few things to tide us over until we got a decent breakfast. At the store we asked if we could fill our water bottles and were informed that they used to have a water fountain outside, but some redneck tied a chain to it one night and dragged it off. WTF? They said that the church behind the store had a hose and we could fill our water bottles there ~ and we did. It was a beautiful morning when we left Elbe, but shortly afterwards the fog started to roll in and greyness stayed with us for the rest of the day. Not too far out of Elbe we came upon a detour/road closed sign, so we sat down, had “breakfast” and pondered our situation. After a lengthy discussion and much scratching of our heads, we decided to chance it and go through. 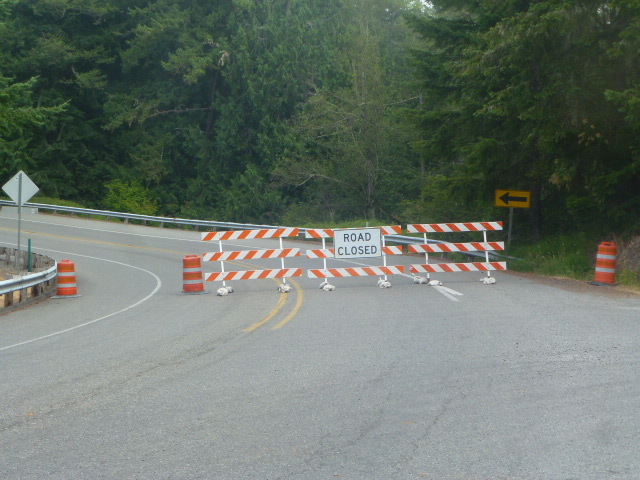 If we took the detour it would have added at least 10 miles to our day so the decision was actually quite easy. The fog brought a chill so I put on the rain jacket I bought in Portland and I was surprised at how much it took the chill off. It was really nice riding on a deserted road in the fog and it felt calming ~ I came to the conclusion that we made the right move by taking the closed road and when we came upon the area that was affected by a landslide, we noticed that it was almost cleaned up. There was some upheavals in the pavement, but nothing that warranted us even touching our brakes to slow down. The only negative thing was that Tai got bitten by a wasp. A price I was willing to pay for a quiet road masked in the fog. The ride to McKenna was pretty uneventful and the grey weather made us put our heads down and push out the miles. It was Sunday and I was surprised at how much traffic we saw. It then dawned on me that we were getting close to the south end of the Olympia/Tacoma/Seattle megatropolis. We saw a huge Jehovah Witness church with a lot of cars in the parking lot, confirming that it was indeed Sunday morning. 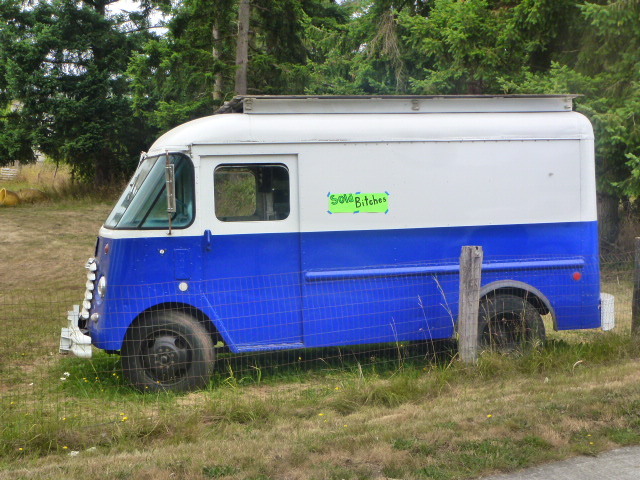 When we pulled into McKenna/Yelm, the first town of any size since leaving Elbe, we had covered almost 50kms. Upon seeing that Jim Bob’s Chuck Wagon was serving breakfast, we didn’t hesitate to stop. How could you pass up a chance like this? Only in America! The breakfast was big and the coffee refills came quick, so it got high marks from the both of us. After leaving McKenna we passed though Yelm, which is almost a continuation of urban sprawl. It was nice that they had a bike lane running through the town and we were back in the countryside fairly quickly. The fog had lifted but it was still grey. 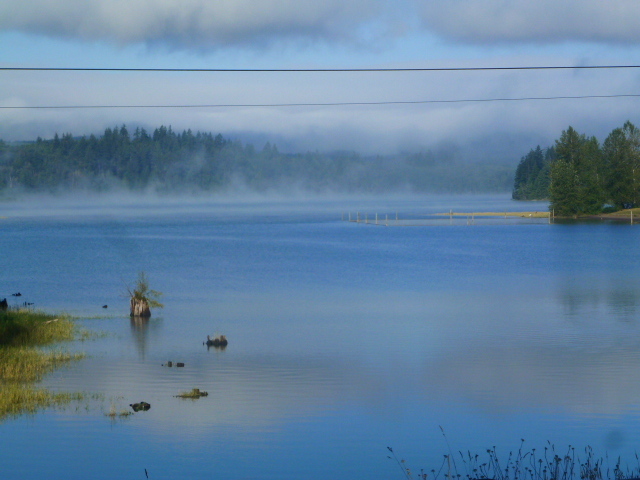 The scenery was uninspiring and we decided that we would look into getting a hotel room in Olympia if we could. 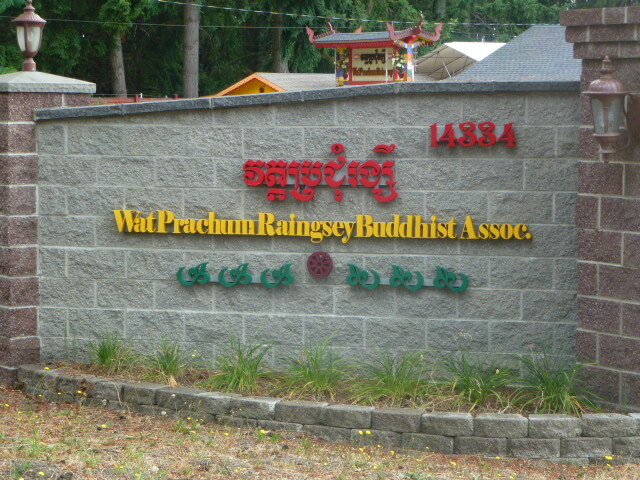 Just before we got to Lacey (kind of a suburb of Olympia) we came upon a Thai Buddhist temple/monastery that was a welcome surprise, even if it did feel totally out of place. We stopped and had a guardrail break and noticed a discarded needle on the shoulder. Hmm, not cool. Lacey was actually a fairly nice town that had a big university. 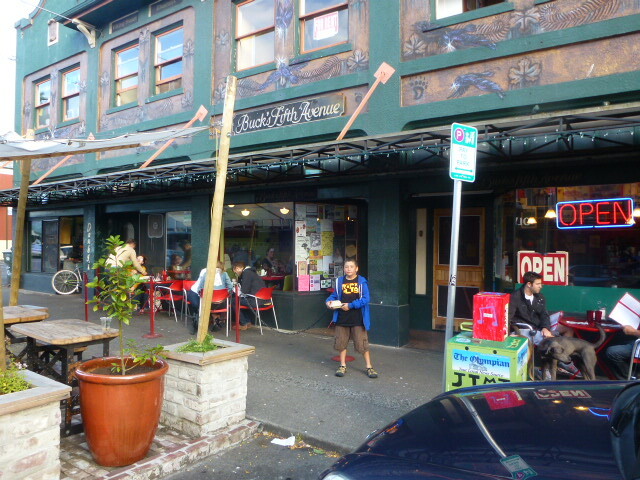 There were lots of shops and we noticed the chain stores and restaurants that we hadn’t seen since leaving Portland. 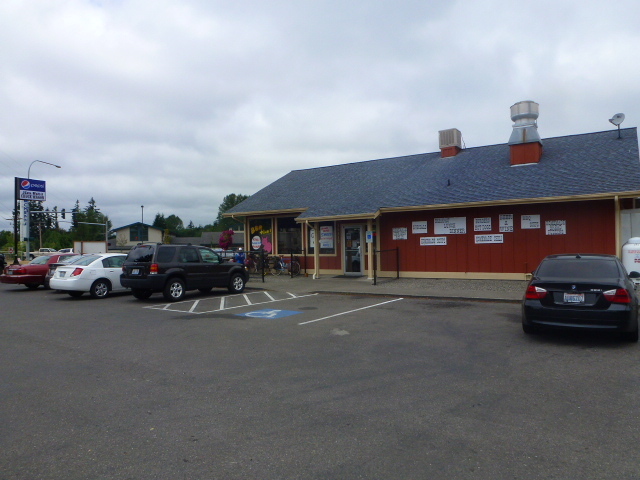 We remarked at how they lacked the character that the mom and pop shops and restaurants had. We were back in mainstream America. After passing through Lacey and crossing under the I-5 highway, we were soon in Olympia. It was nice that we had a big downhill in a bike lane right at the end of the day that dropped us right downtown by the river. We found Old Town Bicycles and stopped in there to get some local information. We were treated like heroes as they don’t get many bicycle tourists coming through. I guess they were easily impressed 😉 We chatted with them for a while and they gave us some great advice in regards to hotels and restaurants and the local scene. It so happened that Olympia was celebrating “hemp day”, so there were more than a couple of baked people wandering around town. The hotels were close by and we chose one that fit our budget and felt right. Nice place, but I’m pretty sure the clerk at the desk just came back from the local celebrations. 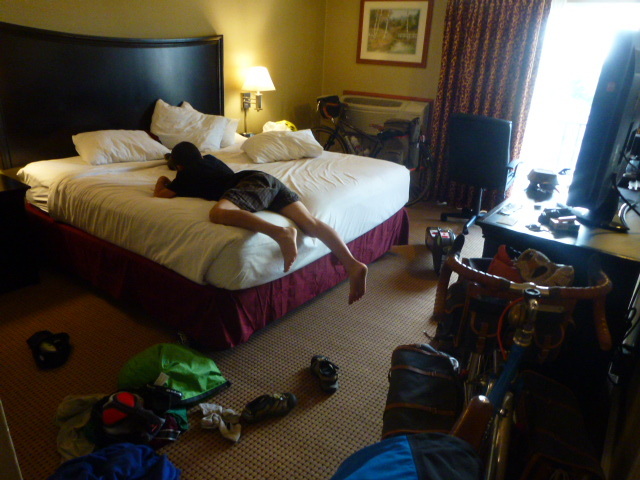 The clerk had no problem with us bringing our bikes into the room, so that’s what we did. The first thing I did after getting into the room was hit the bathtub. Ahhh, the simple pleasures in life are the best. I must of soaked for a good half hour before I even thought about getting out. By the time the both of us finished taking a bath, there was a nasty ring of dirt that would require a good scrubbing by the unfortunate housemaid. All spruced up, we were ready to hit the town and find some dinner. 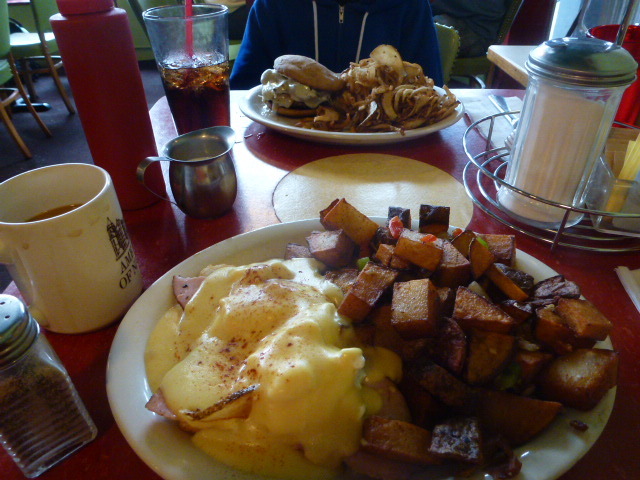 They guys at the bike shop recommended Darby’s Cafe because they were known for their huge portions and good food. It also helped that it was just around the corner. Yep, it lived up to its reputation. The decor had a Wizzard of Oz theme that somehow fit the place. Our waiter/waitress was a transvestite that had a 5 o’clock shadow that George Michael would envy. Tai just looked at me and rolled with it. After dinner we wandered around the downtown area, but being a Sunday evening there wasn’t much happening. Downtown Olympia was definitely funky and it kind of reminded me of Queen St. West in Toronto. We grabbed a coffee and headed back to the hotel where we were able to Skype with Norie and Ekou. It was great to catch up with them and it was a nice way to end the day. What was also nice was sleeping in an actual bed. Granted, we slept in a bed at the Portland Hostel, but that was no comparison to the luxury we found ourselves in tonight. This entry was posted in 2013 Summer Bike Tour, 4 Legs and ! Mandolin, Bicycle Touring, Uncategorized and tagged Bicycle, Bike, Bike touring, Darby's Cafe, Elbe, fog, John, McGillivray, Old Town Bicycle, Olympia, State, Tai, touring, Washington. Bookmark the permalink.